Permit, bonefish, tarpon, snook, sportsfish, barracuda and more... Ascension Bay is world-renowned for its seemingly endless saltwater flats. 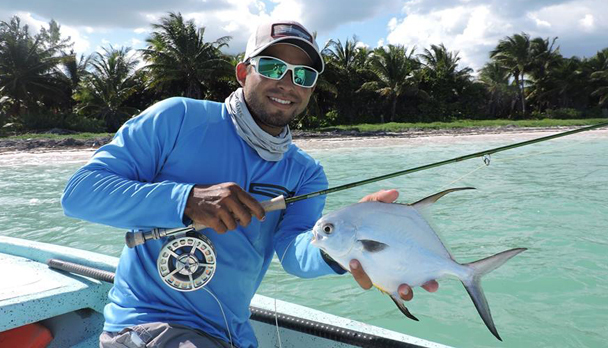 Fishermen come here primarily seeking the challenge of the elusive permit and bonefish, plus the chance to nail a Grand Slam. It's a diverse fishery for experts and beginners alike. 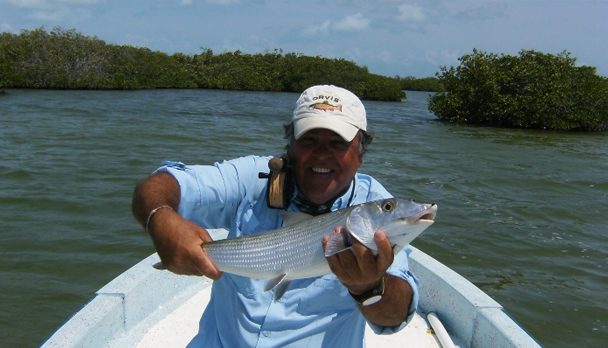 There are crystal clear flats with depth of one to two feet, home for small bonefish, and of three- to four-foot-deep flats where bigger bonefish and permit roam. There are also restricted channels for longer fights since the fish can't run and tire out, deep holes for lurking monsters, protected areas when the wind kicks up, and a 70-mile reef for migrating game fish. The fishing is year round and the high season is from March to June. 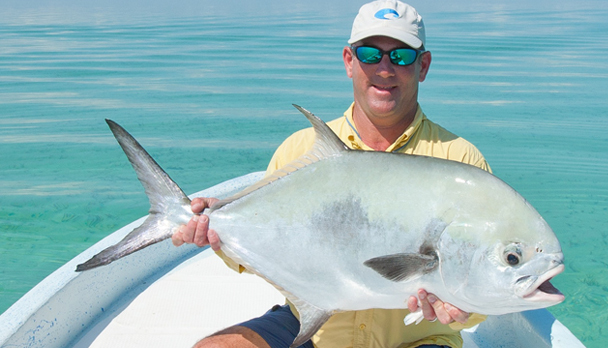 Good fishing flats are just minutes from the lodge; the best spots are a 20- to 45-minute boat ride. All fishing in the biosphere reserve is catch-and-release. For fishing diversity we can range north to Boca Paila lagoon and south to Espiritu Santo Bay on request. Situated on a narrow, palm tree-studded strip of sand, the Lodge faces the Caribbean on one side with the lagoon lapping on the other side. It has has 12 beachfront villa rooms, each with 2 separate bedrooms, air conditioning, king-sized beds, satellite television, wrap-around deck and locking rod racks. The main lodge has a tropical thatched-roof design with natural flair. It features a social area, a bar with swings for seats, swimming pool and Kai Restaurant with a covered beachfront deck. There's a library, computer and fly tying station. 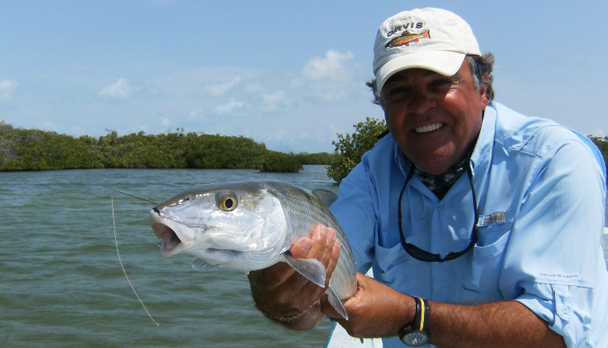 We suggest bringing one #8 Wt rod for bonefish and one #9 Wt or #10 Wt for permit, baby tarpon and snook. High-performance reels with a good brake system are required, capable of holding 200 - 250 yards of backing. 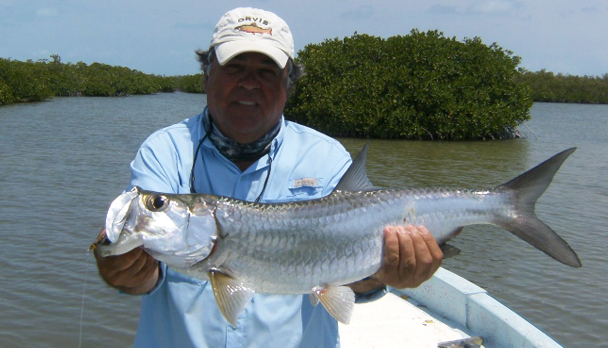 Weight forward floating fly lines; an Intermediate line is recommended for baby tarpon. 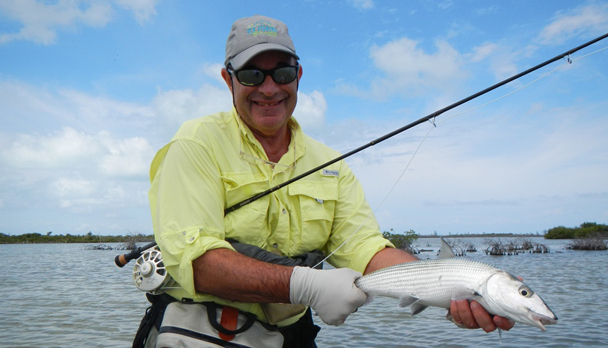 For bonefish and permit, use 9 or 10-foot knotless leaders, 10 to 12-pound test. 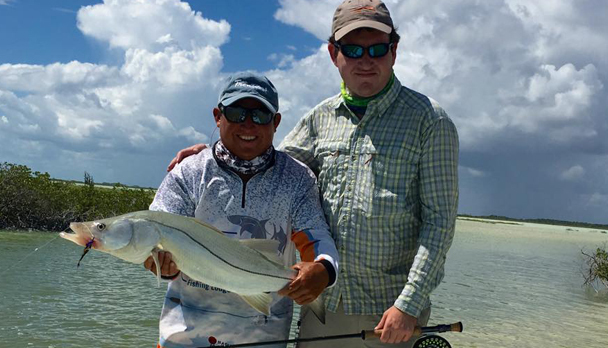 Bonefish fly selection should include Crazy Charlie, Gotcha or any shrimp-like pattern on hooks 8 or 6 in tan, pink and white with flashabou. For permit: Brown Special, Fuzzy Crab, Rag Head Crab, Mc Crab on hooks sizes 6 or 4, in tan with white legs, brown and sand. Both for bones and permit the flies shouldn�t be too weighted. 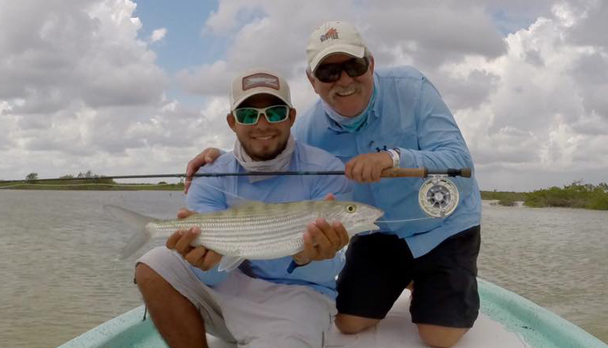 For baby tarpon and snook we recommend leaders with 60 pound hard shock tippet. Flies should be tied on hooks sizes #2/0 and #3/0 TOAD styles, deceivers or seaducers in brown and orange, brown and yellow, orange and yellow, black with red, black with purple. Rates include: Transfer Cancun - Lodge - Cancun. 6 full fishing days, 7 night-accommodation. All meals and non alcoholic beverages during fishing days at lunch. Fishing license, skiff and bilingual guide. Rates do not include: International flights, health insurance, personal expenses, fishing insurance, fishing equipement and flies, alcoholic beverages, laundry and gratuities for staff and guides. The weather wasn�t very helpful, a lot of wind and rainy days. Nevertheless big schools of bonefish were seen of approx. 150-200 of big sizes, together with permit too. 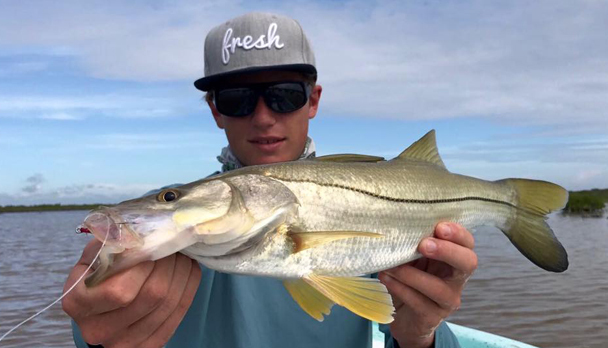 At this moment there are many snook, around 33 lbs. 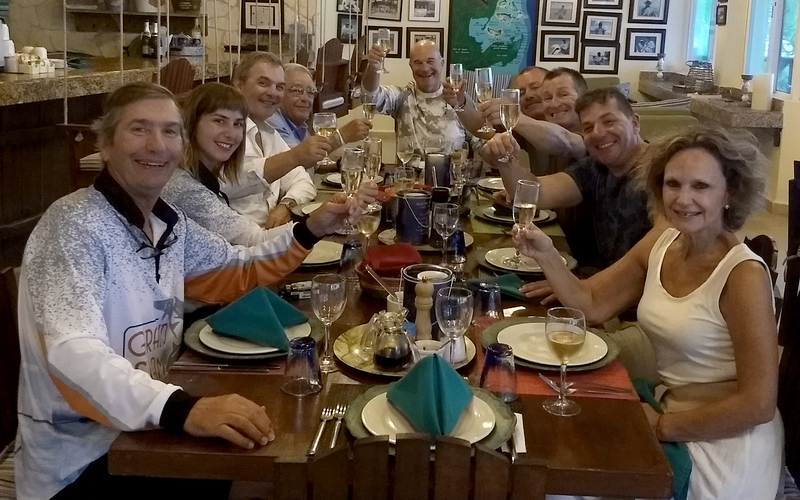 I didn�t want to let one extra minute go by without thanking all of you for making this a wonderful trip at GSFL in Punta Allen. I have so much fun with all of you! I mostly want to thank Daniel Beilinson for his, once again, impeccable organization. Sometimes we all give things for granted during a trip, and our experiences throughout other operators have indicated contrary. 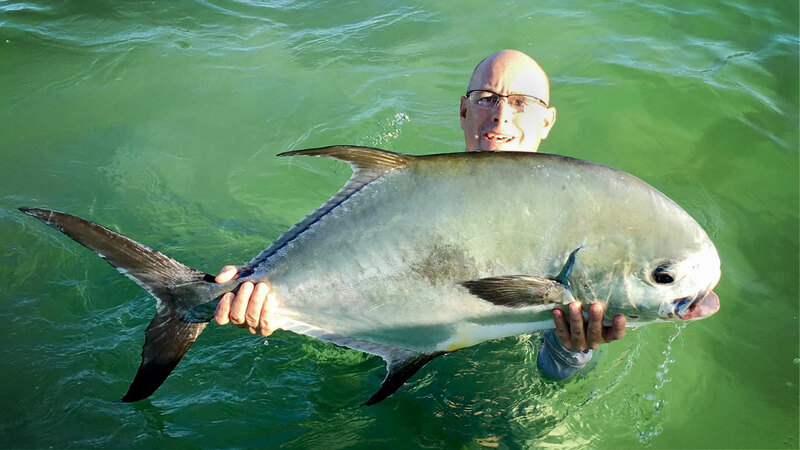 Daniel not only organizes fishing trips to new and amazing places at reasonable prices, with friends and comrades, moreover everything goes as expected almost always thanks to his dedication and the expenses always close perfectly� and we even fish!!!!! Thank you everybody again and a special thanks to Cecilia and Antonia for making our trip more beautiful. Seriously speaking, everything went out perfect, the lodging and service were really good, Miguel Encalada was very kind and took care of every detail. The guides were very helpful and knew the area in perfection. Even though there wasn't any permit landed, 3 cut and 2 lost, we saw a lot and were able to cast many of them. As I said "we fished very good, but landed not many fish" and this is what we came to. A very good destination to come back. Thank you Daniel for all the organization and we keep in touch. A great place for a Grand Slam! I wanted to write a couple of lines about my trip to Grand Slam Fishing Lodge in Ascension Bay, Mexico. The lodge is a real beauty and the place a paradise, the rooms are above normal and huge, nicely decorated and luxurious. If you walk out of the room, there's no need for shoes and you're right off the boats ready to go fishing. The food is ok and the staff very helpful and kind. Miguel, The Captain, was very nice and looking after every detail. Unfortunately the fishing was slow due to the weather. There was a lot of permit but weren't lucky and also we couldn't go for big tarpon next to the barrier. I also saw many snook. It is a definite place to go for a Grand Slam. I'll return next year.